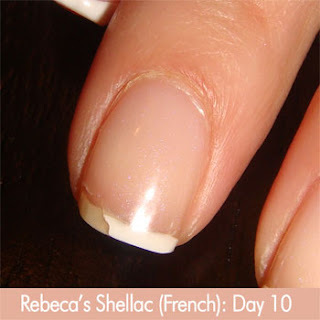 Troubleshooting: Ensuring that a Shellac manicure delivers on it's 14 day promise. the CND Shellac protocol and usage directions. Most of the time, just adjusting your technique, and using LESS product can help troubleshoot problems. - Polish application was too thick -- Thin and even coats work best. - Never Skip: Eliminating surface oils by scrubbing the nail with ScrubFresh before applying Shellac UV base coat. - Polish application was too thick. - Must be using 36 W Lamp for curing. Peeling / Lifting: Keep in mind that THIN layers are key to a successful Shellac application. A think layer of polish or Top Coat can make the product peel off the nail. Keep in Mind: Shellac is NOT a strength building product, it's a replacement for polish on manicure clients that want a longer lasting results. Nail enhancements may be a better choice for clients that need a nail make-over of some kind. Clients with brittle and dry nails that chip or peel easily, and those with thin nails that bend easily are NOT ideal clients for the Shellac service. About my nails & my Shellac experience. Let me start of by saying, I am not the ideal Shellac candidate. My nails peel, chip, bend and break 1-2 times a week. So, due to my nails' delicate condition, I did not get an entire 14 days out of my Shellac manicure... but I did have a glorious 10 day love affair with my Shellac French Manicure until I chipped a nail. Yet, despite my natural nail short comings -- I AM CRAZY IN LOVE WITH THIS PRODUCT! What My Shellac Manicure SURVIVED IN 10.5 Days! - I caught my nail TWICE in the zipper of my handbag -- not a scratch, tear, break or chip! Astonishing. - I accidentally spilled Tea Tree essential oil all over my manicure (massage training class). Usually EO's eat through my polish -- my Shellac did not budge! - I rearranged the furniture on my Patio, re-potted 6 plants (without gloves) and scrubbed windows. No problemo! - Went to COSTCO. Enough said right? After I got home with 3 shopping carts of stuff, I opened countless cardboard mega-boxes with atomic cardboard pull tabs that ALWAYS kill my polish... not this time. Even survived opening plastic, clam shell packaging... that alone is amazing! - I PEELED the labels off of a new set of 4 glasses with my nails... not a CHIP! - Survived my OCD hand washings. I have an excessive hand washing ritual & a Purell addiction. Probably why my nails peel! But as predicted, my peely nails finally did their thing, and I had my first Shellac casualty in the late evening of day 10 (as you can see from photo). Nothing major happened. I was reading my Kindle, looked up and my stomach sank... the corner of my nail had peeled and chipped away. As you can see, the Shellac only peeled back with the break, and did not peel off entirely. Notice that my French Shellac mani still looks GREAT after 10+ days! I had a little bit of grow out, but other than that - my nails look amazing. Summary: Assess your clients natural nail before the service. A client with strong, (non-peeling) natural nails are your best candidates for a 14 day Shellac result. For clients with nails in less that "perfect" condition, Shellac will still provide a longer lasting manicure than conventional nail polish - but it may be shy of 14 days. UPDATE! Click Here for more CND Shellac troubleshooting tips on the Pure Spa Direct main web site. Thank you so much for the troubleshooting info! I LOVE this product! Finally! After being in the industry for about 25 years, we finally have something we can send our natural nail clients out with and know that they will LOVE their nails! I have one client who I am noticing her Shellac receding around all the edges after each coat. I even Scrub Fresh'd twice! Making sure to get all the oils off the nail plate. Any suggestions? One way to decide a niche market is to visit and spot the first products. first provider of products and displays that the marketplace is hungry. I had my first Shellac manicure around Easter last spring. I was amazed at how long it lasted. I also have problems with peeling nails, and the Shellac manicure helped my nails grow out longer and stronger than usual. I received a SpaFinder gift card for graduation and found a spa that offered Axxium manicures. I had about 4 manicures there (until I was out of gift cards). I thought it was the same thing... It's not! The Axxium was much more difficult to remove and peeled layers off my poor nails. I have gone back to Shellac, and it is so much easier to remove and left my nail undamaged. It has also helped strengthen the damaged part of my nail and allow me to have long, beautiful nails to help show off my engagement ring! I have had some lifting, especially on the still damaged, thinner parts of my nail. I'll try applying the product in thinner layers next time and see if that helps stop the lifting. Thanks for the advice! Thank you so much for the info! I guess i have to wait till my nails grow out to use the color because my nails are damaged from acrylic wear. I am able to use just the base coat and top coat so my nails look clear and shiny.